"I'm not building a ship, sir. I'm trying to make things grow." 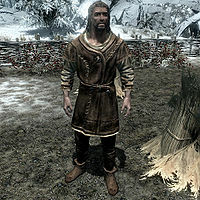 Tulvur is a Nord farmer living at Hollyfrost Farm east of Windhelm. He lives there alone with two dogs, Tiber and Ysgramor. He gets out of bed every day at 8am and always starts the day with a one-hour meal. At 9am he heads outside and starts working the land and is soon joined by farm owner Torsten Cruel-Sea who helps him out for a few hours. 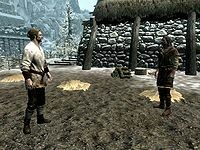 At 7pm Tulvur returns to the farmhouse and enjoys a one-hour dinner, then spends the rest of the evening loitering around until he goes to bed at midnight. He wears a belted tunic and boots and carries an iron dagger, the farmhouse key and a selection of common items and gold. When approached he will tell you, "Master Cruel-Sea comes and works the fields sometimes. I don't think the Mistress likes it, but she won't come out here to catch him." He will also reveal his plans to get the two residing dogs to help him with his work: "I wonder if I could put the dogs to work somehow. But I don't really have the heart to force them." He reasons with: "Once the sun goes down, it's just me and the dogs. They keep me warm, and don't talk too much."